The Breville Hemisphere Blender is a blender that leverages its new blade design to chop and crush its way to velvety smooth results. The new Patented Hemisphere bowl and blade system work together to draw down what's on top in the jar, down to the bottom where its wide bowl hugging blade finishes the job. The 48 ounce jar, made of BPA Free Tritan copolyester includes the Breville Assist Lid, a design that ensures not only a tightly sealed lid, but also is easily removed with its unique ring pull. Want total control at the touch of a finger? 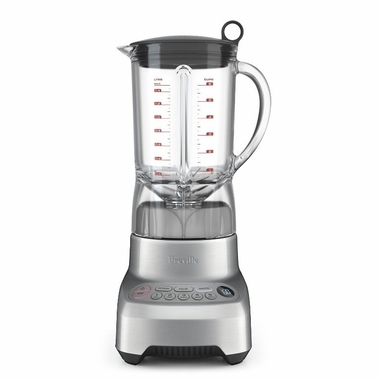 The Breville BBL605XL Blender has a pre-programmed touch controls allow for complete control all while the LCD display counts up and down on speed settings. The LCD display timer paired with the pre-programmed settings will ramp the speed and power up and down as required for ice crushing, smoothiers, food processing and more! With a high torque 750 Watt high power motor and patented surgical steel blade, the Breville Hemisphere Blender consistently delivers quietly and efficiently.